Looking for a creative ideas for your guestbook? Use these fun ideas!!! Get a picture of you two, get it made into a puzzle and then have your guest sign the back of the pieces. Put it together with your spouse after the wedding and see all the fun things your guest wrote! Are you guys game fanatics at home? Have your guest sign Jenga pieces and build it next game night and read all the fun notes! Need extra décor in your new household as one? Get wood pieces that spell out your last name and have your guest sign it! Hang it up and remember your special day forever! Budget-friendly photo booth idea. Purchase a couple of polaroid cameras (available on amazon) and let your guest take pictures, tape it in a book with creative tape and sign! You can also add props to add some fun! Have a quilt made and have your guest write messages on the squares! You can read it every time you cuddle with your loved one! Wine lovers? 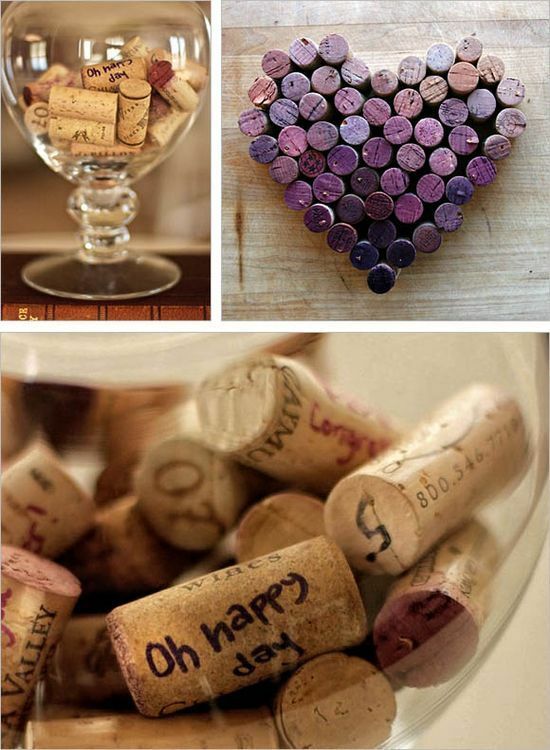 Start saving all the corks from special moments spent together and use them on your wedding day to have guest sign! Place in a large vase or make fun designs with them!!! All these ideas are fun for your guest and memorable ways to look back and remember your wedding day and attendees forever!